Moose calling is underutilized by hunters and I can't understand why. Are moose hunters afraid to make noise? Are they afraid the sounds they will make are not right? Or is it they just do not know how or when to call? Where then lies the secret?? Knowing how, where and when to call moose. 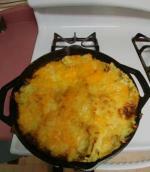 The results of moose calling. This bull crossed a river and a valley in search of his 'Lover'! Calling moose, like many things in life; practice makes perfect. Try calling moose, it is not hard to do. Get yourself a CD, DVD or google calling moose and try to mimic the sounds. You pretty much cannot screw this up. Calling moose is not hush-hush, it is not mysterious. This is a tool that we should all use. Just as a plumber has many tools in his toolbox, so should a moose hunter; a moose call is one of them. There are no hard fast rules when it comes to a calling sequence; rather, your calling success is dependent upon two things. First: there has to be a moose within earshot. Second: they have to want to come to you. Just after first light we walked in to the edge of a meadow along an unused logging road. We called this bull moose to within 100 yards. We used one of our tips for moose hunting... we used a birch bark moose call. Read – The Story "Calling Moose"
You just have to be a little brave and make a noise that you have never made before. Learning to call moose is much easier than learning a second language. Basically there are two calls to learn; the cow call and the bull grunt. Cow moose are vocal year round. They communicate with one another and to their calves this way. The calls are soft and short, lasting about 2 seconds. During the estrous this is a different story. When cows go into heat their calls will ring out across the forest. It is not uncommon to hear a cow moose call last 5 or 6 seconds or even up to 30 seconds at this time of year and more often than not they repeat it two or three times. By far, our preferred method to hunt moose is calling, and to call is a birch bark moose call although this year we have switched to our fiberglass moose call. We have had huge success using the birch bark moose horns to call moose. 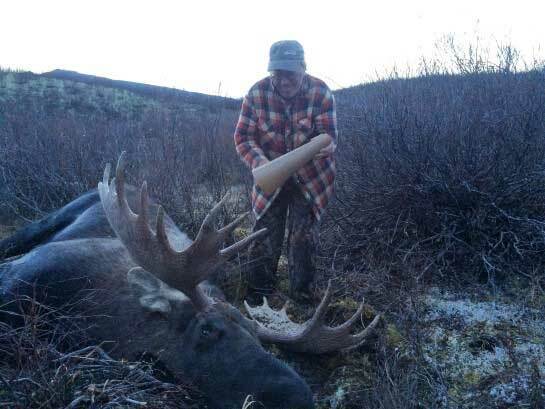 There really isn't much more satisfaction than calling in a giant bull moose in using a centuries old traditional tool. The sounds that resonate from birch bark calls is really good. Use your call to dip and pour water to imitate a cow moose urinating or use it to imitate a bull moose thrashing a bush... it works! Check out the birch bark moose calls. Bull moose on the other hand are quite quiet. Until the rut that is! During the rut, bull moose become vocal too. Calling moose has the most effect during the rut. The rut in most areas is a four week period from the beginning of the last week in September until the end of the third week in October, with the middle two weeks being the peak. 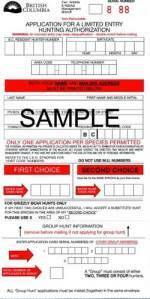 We will assume for this article you are planning to or are hunting during the rut and the purpose of this discussion is about the use of moose calls. The best times of day to call moose is from first light until mid-morning and then again from mid-afternoon until dark. Note I said these are the best times, if you are out hunting all day, it does not hurt to call all day. You never know when a curious bull will show up! When I am going to be calling moose, if practical I always try to approach the area from the downwind side of where I hope to call moose from. Although this is not always possible, you can help redeem yourself if you use scents and take precautions against allowing human odors spread by using scent elimination products or scent blocker clothing. 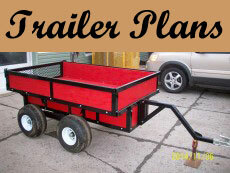 Try to arrive at your calling site with plenty of time for things to settle down before you make your first call. I usually wait about 10 or 15 minutes before I make my first call. My preference is for the traditional birch bark call. * The birch bark call is nothing more than a rolled up piece of birch bark. Rolled into a funnel shape and secured so it does not unravel; simply put it becomes a megaphone. I have seen any number of variations of the birch bark call: plastic bottles, vacuum cleaner nozzles, fiberglass cones... I heard of one hunter that was using a highway pylon. 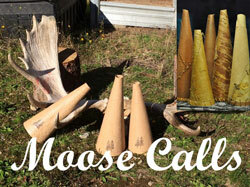 *Note: We have now switched to using a fiberglass moose call that we developed and are now manufacturing. These calls are the best in calls and I definitely will continue to use them. There are also many types of commercially made calls that have reeds built in to them. With this type of call you do not have to use your voice. My first calls are usually soft and short, made without the aid of my megaphone. I cup my hands around my mouth, plug my nose with my index fingers and make a low moaning moose cow call. I will make two or three calls in sequence and then listen intently. If I don't get any response after waiting 10 -20 minutes I will call again, this time a little louder. Maybe with my birch bark call. If I am incorporating antler thrashing into my calling I will sometimes move quietly to a new spot, a hundred or so meters from my cow calling spot and then thrash a tree. This is to simulate a bull that is interested in the cow that is calling. Upon returning to my cow calling spot, I will cow call again. By imitating a cow moose sound the bull moose in the area think there is a cow moose in estrous and in need of being bred. If a bull is interested he will come to investigate. Do not always expect a bull to come right away, or make any grunts as he comes. He may hear you but be a long distance off, or he may be intimidated by larger bulls in the area and come in quietly, in hopes to breed the cow. Moose do not always rush in, so be patient. When moose hunting and calling I will usually stay in one area from first light until late morning or mid-afternoon until dark in the same area. Sometimes it is effective to call in an area in the morning and return the same evening. What may happen is a bull that is bedded in the morning may hear you, but because he is down already will not move. Once he begins to feed again in the afternoon he may go towards where you called from. If you are not there... well, you know! 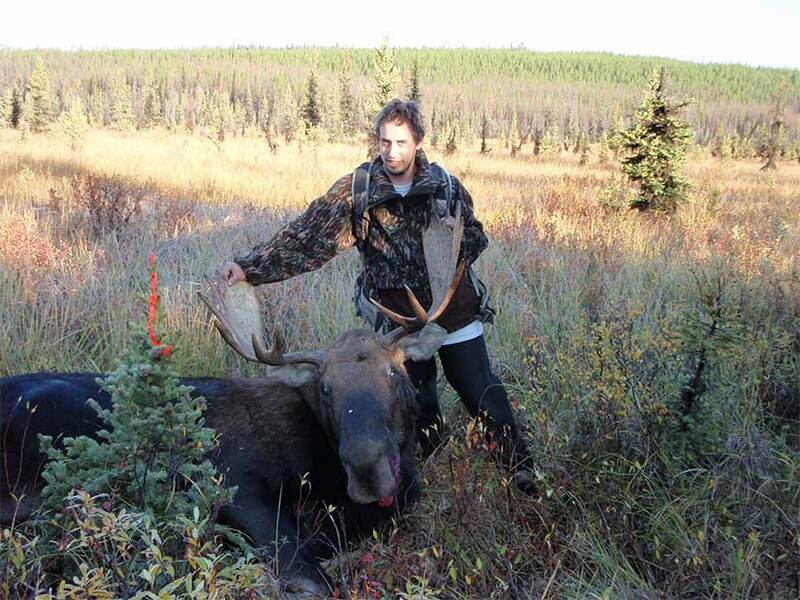 Another moose hunting tip is to call during an evening hunt and return to the same spot in the morning. Sometimes a bull will come during the night. You can read more about moose calls here. Is PreSeason calling a good idea? What do you do if a bull answers and comes directly in to your beckoning calls? You can't shoot him! Learn how to call moose, when to call moose and where to call moose. Mastering these three important aspects of moose calling will increase your success rate. 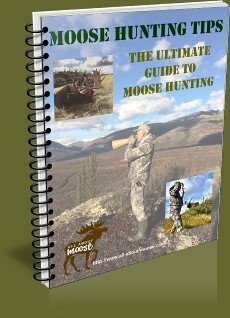 An hunting story of calling moose; learn how the bull moose reacted when we used various moose calling techniques. Calling bull moose in for a close shot. 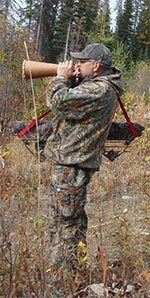 Archery hunting requires the game at close range and offering the correct shot opportunity, it does not always happen. Moose Calling Tip, use an old shoulder blade to mimic a bulls antlers... we explain how! Calling Moose in Close - Well at least I tried too! I was calling moose and had two bulls coming in. In the end I did not fire a shot... Let me explain why.